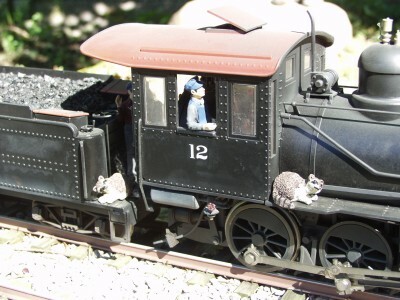 The Raccoon Creek & Gully is a freelanced outdoor model railroad that represents a successful and thriving narrow gauge railroad. The setting is Southern Ohio and the line runs from the fictitious town of Summit and ends at the Ohio River. Although not all equipment is based on a specific prototype, it is all intended to represent the basic character of narrow gauge railroading. The time period modeled is the ten year span from 1920 through 1930 and most prototype equipment modeled existed in the 30 year period from 1900 to 1929. Most of my equipment is based on Eastern narrow gauge prototypes, specifically the East Broad Top and the East Tennessee and Western North Carolina with a dash or two of the Ohio River and Western thrown in for good measure. The Raccoon Creek & Gully is a work in progress. In the beginning all of the track work was hand built using wooden ties and code 322 rail. More recently I have switched to Trex ties and will eventually use commercially available flex track for everything but switches which will still be hand built with Trex ties. Locomotives are battery powered and controlled by the Revolution radio control system and most of the locomotives are equipped with Phoenix sound systems. Most of the turnouts are manually operated using home made switch machines. Loop switches and a couple others in hard to reach areas will be air operated. Most of the rolling stock and motive power is upgraded and kit bashed Bachmann equipment with some scratch built locomotives and cars. I started accumulating large scale equipment in 1992 and the first spike was driven in the summer of 1997. Please check out the links at the left to learn more about the RC&G. I am a member of the Columbus Garden Railway Society. Their website can be found by clicking on the logo below.